I am a specialist in Dance on Film, for Augmented Reality and Screen. Currently a PhD candidate at the London South Bank University, School of Arts and Creative Industries and Applied Science. I hold an MSc in Media Arts & Imaging from the Duncan of Jordanstone College of Art & Design (Distinction) and an MA in Choreography from Rhodes University South Africa. Director & Curator for Screendance Africa and an interdisciplinary artist creating Screendance as choreographer, director, editor and producer. Currently collaborating with Susan Kozel on the Screendance and AR projects: "AffeXity" (since 2011)and from 2017 "Somatic Archiving" together with Icelandic Choreographer Margrét Sara Guðjónsdóttir based in Berlin. Both projects are for the Living Archives Research Project at Malmö University. I facilitate Screendance and AR workshops and lectures at festivals and universities internationally: USA, UK, South Africa, Sweden, Germany, Denmark, Rwanda, Brazil, Portugal & Hong Kong. Exposing somatic and affective layers of our urban spaces through dance improvisation and screendance.AffeXity: Passages & Tunnels is a project exploring affect in urban spaces. Dance improvisation and screen dance techniques for video capture and editing are the main artistic modalities. The element of Augmented Reality (AR) lets the choreographies be suspended as hidden layers of media living in physical space and on personal mobile phones. An extra dimension of archived material is added, letting AR be part time-machine part performance of memory. This artwork can be experienced individually, or as part of coordinated groups, or you can see the AR media combined with a live performance. DansAR 01 & 02 an AR Performance Project, in collaboration with Jeannette Ginslov, Skånes Dansteater , Living Archives at MEDEA, Prof Susan Kozel, Prof Daniel Spikol and Masters Students from the Department of Computer Science at MEDEA Malmö University, Malmö, Sweden. 18 Feb-01 March 2013. DansAR 01 18-22 February 2013 was an AR Performance and Screendance Project in collaboration with four disabled dancers and a choreographer, Melody Putu from Skånes Dansteater. Together with the collaborators from MEDEA it explored movements and choreographies set by the disabled dancers and Putu. Eight videos were shot and edited by the writer, converted to image based videos on Aurasma and later tagged onto the real environment at Skånes Teater auditorium. 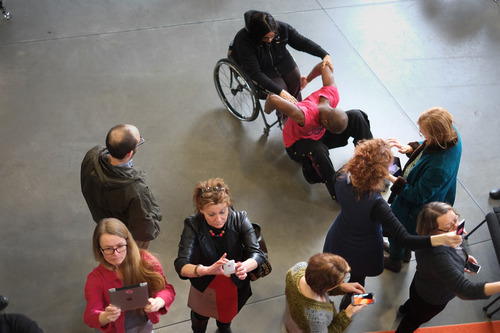 It culminated in an informal presentation, 22 February, that integrated live performances by the disabled dancers and AR videos. The audiences using the augmented reality application called Aurasma triggered the tagged videos by moving from one designated spot to the next and then viewed the short live performance besides the tagged spot. DansAR 02 25 March-01 March 2013, was an AR Performance and Choreographic Project in collaboration with Skånes Dansteater and twenty five dancers from Lund’s Dance & Music Gymnasium, Sweden. The dancers divided up into four teams and learnt choreographies from Putu which they then adapted to their location and concept of their videos. They then shot and edited the short screendance works in locations in and around Skånes Dansteater: the children’s park, the skate park, the entrance to the University and inside the Skånes Dansteater building. They made triggers for the videos and a journey was created for the audiences for the final event, 01 March 2012, that attracted over 50 viewers. The audience was divided into two groups each group experienced a different AR journey, going from outside to inside the building. It culminated in a large dance ensemble where all the students performed the main dance sequence live for the the assembled audience. The most affective AR outcomes were the ones shot and created by the “Swedish Meatballs” group who created auras at the Skate Park. The five dancers wore their triggers, images of daisies, on their backs, shoulders and held them, so that they moved with them. The one dancer stood in the skate park bowl and lured the audience members into the bowl. Here the dancer improvised, moving his trigger quite significantly. The audience member had to then move in tandem with him, so as to keep the AR video looping on the mobile device. A choreographic moment was born, a mobile encounter took place. The final event was part of the Living Archives project at MEDEA. @ MEDEA Feb to April 2012. This is a mock up of what could be possible with the Argon Browser using QR codes to access and elicit embedded AffeXity web clips in the city of Malmö. This video is an attempt to recreate the experience of what the viewer will see when at the "performance" of AffeXity. AffeXity, a play on both ‘affect city’ and ‘a-fixity’, is an interdisciplinary collaborative social choreography project drawing together dance, visual imagery, and mobile-networked devices. It uses a free open standards augmented reality web browser called Argon running on the iPhone and iPad for the viewing of choreographies embedded in the city of Malmö, Sweden. Short screendance narratives shot in the city area are then edited, focusing on affect and corporeality, and uploaded on Argon. These are geospatially tagged onto certain locations in Malmö, which the will viewers access using Argon on mobile devices, the iPhone and/or iPad. 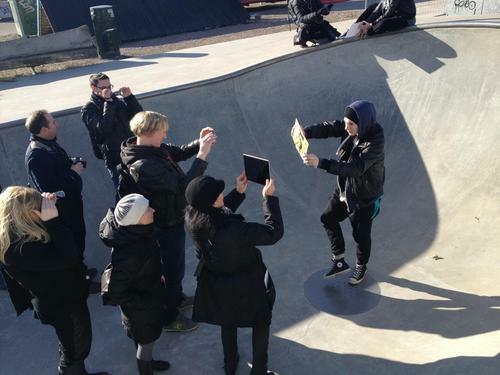 For the final launch of the AffeXity project, videos will be shot in and around Malmö for the performance and uploaded onto the Argon Browser for the viewer to download onto their mobile devices – ipads and iphones. The final AffeXity project will be launched Nov 2012. Several phases have to be undertaken in order to develop the technology and videos. Familiar Stranger – Choreography, Performance and Concept by Wubkle Kuindersma. Direction, camera and edit by Jeannette Ginslov. This was also shot this during the Laboratorium and explored affect and the haptic. It is 11:30 mins long and is a video installation work. It will be featured at the MEDEA evening, on another monitor. "Excellent questions and has given much food for thought. You have also opened up an area that hereto has been far too long ignored, namely inequality, race and the politics of festivals in the CI community. Interestingly enough CI is taught in South…"
Download entry form is ok !! Hello Jeannette, You can send your video, then the jury will define..
loved the sound moves video! You are finally welcome to Dance Africa Sister. Please make contributions as you deem fit. We are still hoping on WORKING TOGETHER, REMEBER? That was just a spontaneous trial with a photo-camera and I used it in an experimental short movie. I do have some more films but in October I will begin to study film at the art-academy, then the number of my films will sourly increase. thx for your fiend request!